Get ready to experience high-performance jet teams, prop planes, WWI and II aircraft, parachute jump teams, wing-walkers, helicopters, jet-powered trucks, boats and fascinating static displays In all manner of combinations, these components are designed to thrill, enlighten and inspire. Veteran air show attendees, Brian and Jo Marie Topolski, tell you what to expect, what to bring and how to position yourself to get the most out of the show. Don’t forget to bring your camera and scanner! 2016 was a trying year for air shows, with both of the Thunderbirds and Blue Angels having crashes on the same day. While the Thunderbird pilot was able to eject to safety the Blue Angels pilot, Captain Jeffrey M. Kuss, USMC, was killed as he was starting a practice demonstration in Smyrna, Tennessee. Kevin takes a closer look at the mishaps. Milcom specialist and aeronautical radio author, Larry Van Horn N5FPW, gives us all the frequencies we’ll need to monitor air shows this season. He writes, “With a radio scanner in hand, you will experience a whole new perspective of the show that few attendees will get to experience—radio communications from the aircraft cockpit of the show performers.” Even if you don’t go to an air show this season, you can use these frequencies to monitor what’s happening in the air all around where you live. 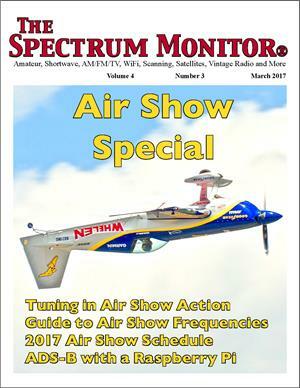 TSM’s Amateur Radio Astronomy columnist goes near-space as he shows us how to monitor Automatic Dependent Surveillance-Broadcast (ADS-B) transmissions from aircraft flying over your house within a 200-mile radius using a dedicated Raspberry Pi computer and an ADS-B antenna. There’s an air show coming to your area of the US and Canada this season. TSM presents the schedules of some of the more popular air show participants including, USAF Thunderbirds, USN Blue Angels, US Army Golden Knights, RCAF Snowbirds, RCAF C-18 Hornet, and Goulin Aerosports. Do You Already Own a Digital Repeater?